The FiiO Q1 is a digital-to-analog converter (DAC) that can decode a variety of 2-channel audio streams (like MP3 or FLAC or Ogg-Vorbis) plus a high quality headphone amplifier. Its main purpose is to give you a great listening result when you plug in your regular wired headphones and then connect the FiiO to computer or smartphone. The FiiO is an alternative to using the device’s own headphone jack, if it has one, or using a wireless system like Bluetooth. You can use the FiiO with conventional (“passive” headphones) as well as noise cancelling types like Sennheiser or Bose. If you are OK looking like you have a flask attached to your phone, use the included elastic bands and rubber pad to lash the FiiO and phone together. This makes it easier to handle, but is sub-optimal (unavoidable I guess) because of the mismatched size between the FiiO and most current phones. The truth is that the FiiO does not, out of the box, include the cables to connect to an iPhone or Android phone, unless you just want to make an analog connection and use the FiiO as a headphone amp only. This option isn’t possible with an iPhone 7 or iPhone 7 Plus, of course. To use the FiiO you need an adapter to put a USB-A “receptacle” type jack (like you’d have on a computer) on your iPhone or Android. For the iPhone, buy Apple’s $29 Lightning to USB Camera Adapter (there’s a $39 version as well) or go to the internet (I used eBay) and buy an inexpensive version (<$5). I’ve used the $39 Apple and the <$5 version, and both work the same, and the thinner wire of the cheaper adapter is easier to handle (and definitely won’t last as long). 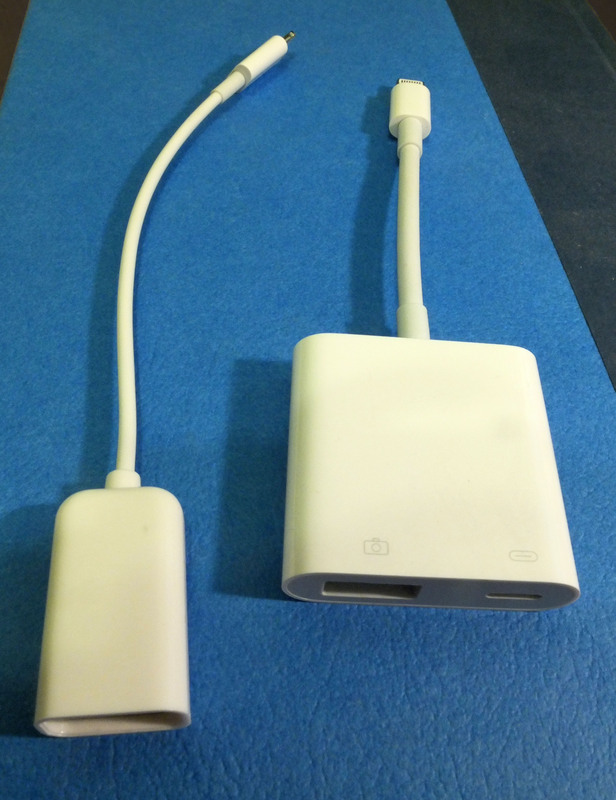 Use one of these adapters plus a USB-A to USB Micro-B cable (a.k.a. a regular old Micro USB charging cable you’d use with your Android or Kindle or most any current non-iOS device) to connect to the FiiO Q1. FiiO includes a longer cable — do yourself a favor and when you’re ordering the Lightning adaptor, also order a very short little Micro USB charging/sync cable, to reduce the bulk of wires. See the photo to make it more clear how having a bundle of wire might be a pain. You can of course just stow the FiiO in your jacket pocket and hand-hold your phone, if you’re prone to reading email constantly anyway. To be fair to the FiiO, the included micro USB cable IS enough to use it as a DAC / headphone amp with your computer. In fact the FiiO and the Oppo both work very smoothly with either a Mac or a Windows machine for playing music. So how does the little flask sound? I played music from three different sources on the iPhone: iTunes, Napster (nee Rhapsody), and Onkyo’s HF player app, which can play FLAC and other formats. I listened through my beyerdynamic T 51 i headphones, which are very neutral sounding. I’m a Bob Marley fan (the musician, not the crappy burlap boomboxes). I listened to several Bob Marley cuts such as Is This Love from 1978 which has a snappy and spacious sound. It’s very different from Bob Marley’s famous records such as Natty Dread or Catch a Fire from a few years earlier, which definitely don’t have as open or clear a sound. On that source, in MP3 format, played from either iTunes or the Onkyo app (there really is no valid technical distinction for an MP3 file), I really don’t hear as big an improvement with the FiiO (compared with iPhone alone or iPhone plus Lightning adaptor), as I do with the Oppo HA-2SE. However, the FiiO sound is more spacious that the stock Apple options. It’s worth noting that the iPhone made the comparison process easy, because it remembered each DAC amplifier device’s volume setting — keeping a comparable volume is really important for making a fair comparison. From Catch a Fire, the opening song Concrete Jungle really didn’t sound all that different with the FiiO, but in my experience that recording’s signature over-modulated reggae bass line causes fits in a lot of speakers and subwoofers. Over the years I have made good use of the song Perfect Blue Buildings by the Counting Crows (from the August and Everything After album). The sound has a very appealing percussive quality that can either come off punchy or muddy – especially when comparing different speakers or headphones. This cut was on my short list of demo recordings when I was evaluation speakers for THX certification in the 1990s. It’s a more subtle different than you would ever hear between speakers, but the FiiO does make this cut clearer than what I hear from the Apple headphone jack. In the case of the Lightning to headphone adapter, the sound is muddier. The FiiO has a lighter quality, less bassy, which possibly is attributable to an altered tonal balance (meaning its frequency response is different from Apple’s) essentially meaning the bass is slightly reduced. The FiiO does have a bass boost switch, but I couldn’t find any recordings where I preferred the boost to be on. I chose to audition a fairly dense baroque piece, the first movement of the Concerto for Four Harpsichords and Strings by J.S. Bach, S. 1065, from an Archiv CD featuring The English Concert. Playing the Harpsichords are Trevor Pinnock, Kenneth Gilbert, Lars Ulrik Mortensen, and Nicholas Kraemer. If you know and understand the sound of a harpsichord, which is harmonically rich and has a fair amount of mechanical noise in normal playing, you’ll appreciate why a concerto including FOUR such instruments makes for a dense recording. While a very good recording, spacious and clear, it is a fairly early digital release dating from the early 1980s. I was listening to a FLAC rip from the CD. The FiiO did a good job negotiating this dense recording, if anything giving a greater sense of spaciousness, but at the same time sounding a tiny bit brighter than the iPhone’s own jack (or the Lightning adapter). The FiiO was less strained if I played it loud (louder, honestly, than I was comfortable listening). 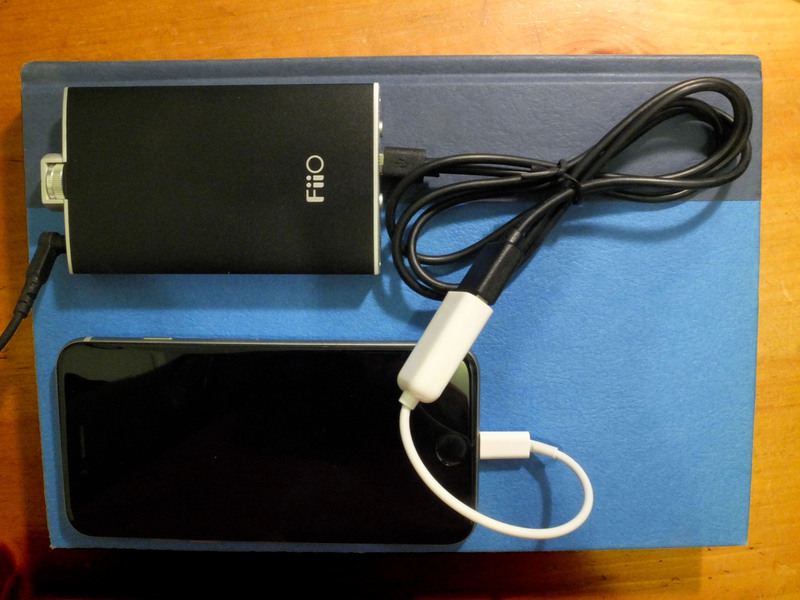 For one, the FiiO doesn’t charge your iPhone like an ARCAM MusicBOOST or an Oppo. If you need to play your headphones louder that you can with the iPhone alone (or iPhone 7 plus its included Lightning-to-headphone adapter), or more importantly if you have a set of power-hungry high-end headphones that need a lot of power, then the FiiO makes sense. If you have average-quality headphones or stock Apple earbuds, don’t bother, because you are unlikely to hear the difference. If you have a library of high resolution music files in lossless formats like FLAC and at higher-than-CD sampling frequencies and bit depths, then having the FiiO starts to make a lot of sense. A recording with muddy bass will be less muddy and more clear and punchy with the FiiO. The acoustic space in acoustics recording is more apparent. While a subtle improvement, the FiiO generally gives a more spacious, lighter sound, without sounding bright. What better way to celebrate Apple’s elimination of the headphone jack than to try out a new DAC headphone amplifier like this one! 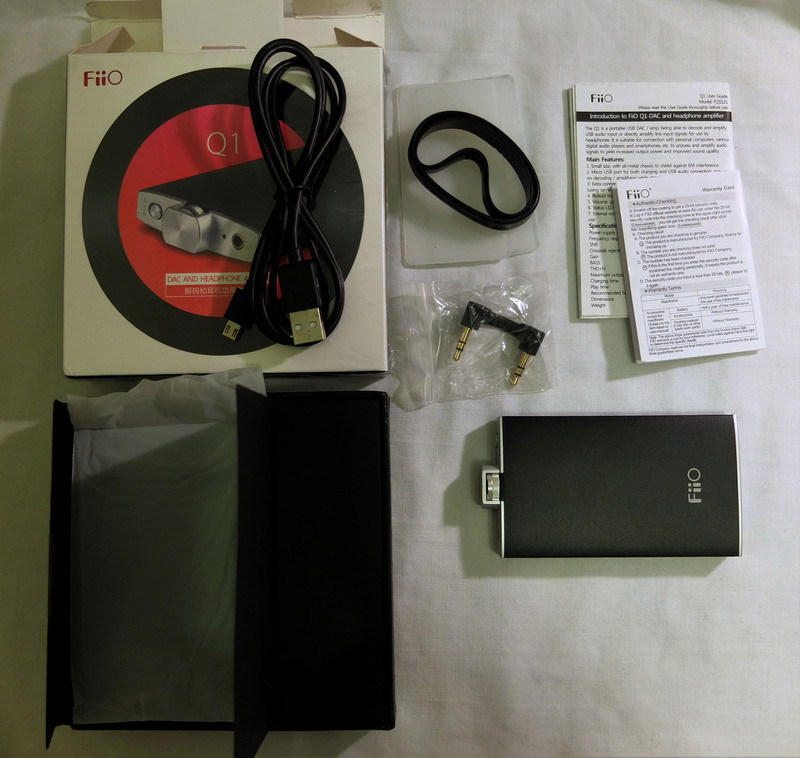 This entry was posted in Product Design, Reviews and tagged Fiio, Fiio Q1, iPhone 7, Oppo by Stephen. Bookmark the permalink. Would the dac+iphone hooked to a car be worth it? Better not to buy a DAC (digital-to-analog converter) just to send it into the ADC (analog-to-digital converter) and subsequent DAC built into the car head unit. All modern car head units (radios) are digital internally. The best way to hook a digital source like an iPhone or iPod is through a direct WIRED (not Bluetooth) digital connection – many cars have a USB connection that can pull music directly from a device via wired digital. Google it. Thanx, very helpful and written with insight and intelligence.